Whatever your location and skill level, North Carolina has a place for you to canoe or kayak. There are more than 40,000 miles of rivers and streams in North Carolina. Some are only a few inches deep, but even they’re open for exploration when you’re paddling one of today’s ultra-light, shallow-running canoes or kayaks. Add in lakes and sounds, ponds and the open ocean, and the options for your next adventure are virtually limitless. Here are 12 paddling destinations across the state, each one offering something uniquely North Carolinian. Cruise down the Blue Ridge Parkway to Milepost 297, three miles from the Moses H. Cone Memorial Park. There you’ll find 47-acre Price Lake, a calm, relaxing place to stretch your legs and your arms. Reserve a space for the night at nearby Julian Price Campground, then watch the sunset from the water. Tip: The lake’s parking lot is open 24/7, so you can paddle under the stars, too. Section 9 of the French Broad, from Barnard Park near Marshall down to Hot Springs, is known for its Class II, III, and IV rapids. Take-outs are in short supply, so carefully plan where and when — water level makes a big difference — you’ll be paddling. Tip: Not. For. Beginners. Go back to Price Lake and hone your skills before attempting this run. The Interstate 26 bridge over the Green is something to behold — standing 225 feet above the river, it’s the highest in North Carolina. Driving over it is impressive, but paddling under it takes the experience to a whole new level. Bring a rod and reel to fish for brook, brown, and rainbow trout, as well as smallmouth bass on the river’s lower reaches. Tip: Many kayakers put in below Tuxedo Dam and take out at Fishtop, an access point on the southern edge of Green River Game Lands. There’s a large pool at Fishtop where beginners can practice crucial techniques, like recovering from a rolled-over kayak. These Class II and III rapids serve as the crossover point from beginner to intermediate paddling. For seven and a half miles, kayakers pass through comparatively easy stretches of the Nantahala punctuated by rapids known as The Bump, Surfing Rapid, Whirlpool, and more. This option isn’t exactly for the faint of heart, but it’s a lot of fun. Tip: Once you feel confident on these mid-level runs, head farther upstream to the Upper Nantahala or, when heavy rains cause this dry section to fill again, the Cascades. These Class III, IV, and V rapids make Whirlpool seem like a baby’s bath. This 520-acre flood-control lake in Wake County serves a practical purpose, but it also offers an escape for outdoorsy folks living in the Triangle. With much of the lake less than three feet deep, Crabtree is a great place to learn how to paddle. There’s also a boat-launch ramp open there year-round. Tip: Head to shore and see remnants of the park’s 19th-century tenant farm, including a stone-lined well. Norman is one of North Carolina’s most popular lakes, and for good reason. Located just north of Charlotte, it’s a short drive away for those in the foothills and Piedmont. Wet a line, or just gaze at the mansions built along the water. With more than 500 miles of shoreline to explore, you can paddle an incredible amount while staying out of the way and wake of powered boats. Tip: Just because you’re not in a bass boat doesn’t mean you can’t catch bass on Lake Norman. Paddle into its many coves and cast around the docks; largemouths love the structure they provide. 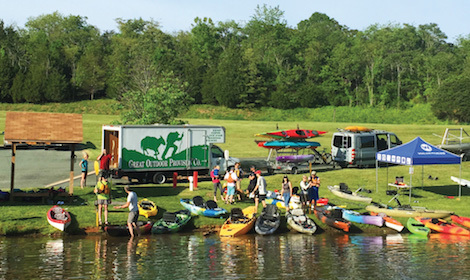 The Paddle Trail is part of Alamance County’s efforts to preserve the Haw by emphasizing its recreational value. There are 14 access points along Alamance’s portion of the river, so paddle as little or as much as you’d like. Best of all, there are both slow and fast stretches to choose from. Beginners can learn the ropes and experienced paddlers can enjoy a challenge, all by choosing where they put in and take out. Tip: Put in below the Sellers Manufacturing Company Lake dam to paddle the Haw, or just enjoy an easy day on the lake itself. No list of paddling opportunities would be complete without mentioning the epic adventure that our senior writer/editor, Jeremy Markovich, undertook in 2016. He began at Moncure, in Chatham County, and spent more than a week traveling down the Cape Fear River to where it meets the Atlantic near Southport. Along the way, he saw ospreys, alligators, dolphins, and much more. Read all about his trip here. Tip: Jeremy received special permission from various landowners in order to camp along the banks, but paddlers can travel the same stretches via individual day trips. “Swampy” but not quite “swamp”: Millponds dot the Coastal Plain, bringing hardwoods together with the bald cypresses that thrive in brackish water. Perhaps the most well-known Tar Heel millpond is Merchants, in Gates County near the northeastern corner of the state. Alligators swim around the cypress knees while Spanish moss hangs overhead. Tip: For a true swamp-paddling experience, drive 15 minutes northeast to the Great Dismal Swamp. There aren’t lions and tigers in Alligator River National Wildlife Refuge, but there are black bears, red wolves, and alligators. Milltail winds through the heart of the refuge, providing visitors with a glimpse of what coastal North Carolina looked like when Europeans first set foot on its shore. 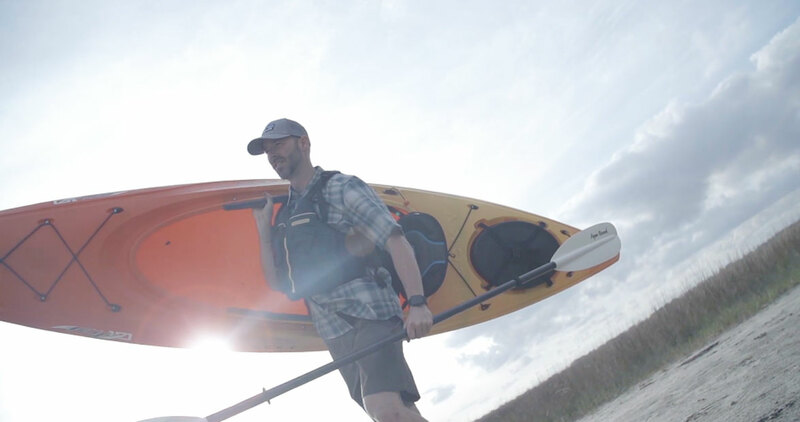 With Roanoke Island just across the Croatan Sound, it’s easy to feel like you’re John White paddling into a whole new world. Tip: You may not see those elusive red wolves, but you can usually hear them. Plan to end your paddle in the evening, when the endangered canines begin to howl. Intrigued by sea kayaking but not up for the open ocean just yet? Put in around Beaufort and visit several nearby islands and salt marshes, complete with wild horses. Sheltered by Shackleford Banks, this area of calmer water allows newbies to ride the high seas — just not too high. Tip: More than 200 species of birds have been seen in the reserve, making this a bird-watcher’s paradise, too. Wrightsville Beach is coastal paddling. Strike out from the shore to ride the waves, stay in close and explore the tidal areas around the causeway, or venture south to the nearby estuarine areas — all just a few paddle strokes from some of the finest coastal dining anywhere. Tie your ride to one of the docks or drag it onto the sand, then hit the town for fresh seafood and more. Better yet, bring tackle and catch your own fish. Tip: Time your paddle to take place during high tide for better access to nearby creeks. Today’s canoes and kayaks come with a wide range of features, and sorting out the needs from the wants can be daunting. Great Outdoor Provision Co. has created a simple quiz to help determine what boat is right for you. To take the Paddle Pro quiz, click here.